Easy Rack has an extensive range of pallet rack beams that are designed to accommodate the diversity of load requirements found throughout the many different storage facilities we serve. Selective pallet rack beams can be ordered in the branded Mecalux style or the industry standard teardrop style. (One thing to keep in mind about the Mecalux style is it will also work with Teardrop systems). Pallet rack beams are adjustable on 2” centers and come in three different options. They can be one piece units, called step beams. They can be JN beams, or they can be Z beams, commonly used for building picking levels. 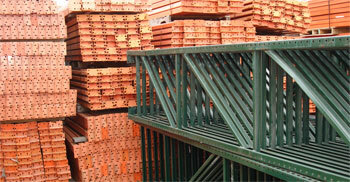 As just noted, the most popular pallet rack beam design is the Tear Drop Step Beam. These range in length from 48” to 144”. Naturally, length and thickness determines weight capacity. Each beam’s safety factor conforms to current Rack Manufacturer Institute standards. Capacities are based on the even distribution of load throughout the beam. Single piece pallet rack beams that measure more than 108” long might have to have extra lateral support placed at the mid span point. (We recommend doing this). Another design that is growing in popularity is the Easy Rack Ergo Beam. This pallet rack beam design has been repeatedly proven to increase worker productivity while simultaneously reducing worker injuries. Standard- The channel flange faces inward to provide a comfortable surface for cartons. Label-Ergo Beam- this has a smooth surface and a 1/8” recessed web that prevents label damage. The great thing about these pallet rack beams is they provide such easy access to hard to reach cartons on lower shelf levels. This is because Ergo Beams create openings between pallet locations so an order picker can approach and comfortably reach the cartons in the rear. This has reduced product breakage in virtually every business that has switched to using this type of pallet rack beam. Businesses are very happy due to the money this saves them on inventory replacement costs. In many ways, it has proven to be the best solution for warehouse workers because of the way it splits the front shelf beam into two separate curved beams that attach to the rear horizontal. The opening this creates allows for plenty of room for order pickers to safely and efficiently access cartons in either the front or rear pallet with minimal risk of worker injury. Finally, for companies whose operations consist of light loads with minimal risk of product damage or worker injury, one great way to save money is to invest in used pallet rack beams. Used Tear Drop models can be bought that range anywhere from 51”-153” in length. Because they are used, there is no way to guarantee weight capacity, which is why we recommend they be used only when minimal risk to products and human safety are assured to begin with. Easy Rack carries a wide variety of used pallet racks, commercial shelving, material handling equipment,and modular prefab buildings installed nationwide. If you can not find what you are looking for call us toll free at 1-888-776-3720 and we will find it for you. Our home office is located in Houston, Texas with warehouses located throughout the United States that enable us to service all 50 states including Oakland, California, Miami, Florida, Tulsa, Oklahoma, Minneapolis, Minnesota, Colorado Springs, Colorado, Arlington, Texas, Beaumont, Tx., Corpus Christi, Texas, El Paso, TX, Brownsville, Texas.